When the Windsor Ryancretes were part of the amateur Michigan Ontario Hockey League back in 1949, Keith Crossman was their coach. During his playing days his company frowned on his extra-curricular activity because they were afraid he would get injured and they would lose his services. The day after he quit the team he fell on an icy sidewalk at work and broke his leg. There are an amazing number of similar incidents which have occurred over the years. Pucksters, who were paid to produce for their respective teams, when “off duty”—away from the arena—were victims of all sorts of misfortunes, which put them out of action for varying numbers of games. Most of these were fluke accidents, many of them so bizarre they belong in a “Believe It or Not” kind of compilation. The eras in which they happened, as well the venues in which they took place, vary greatly. Most them fall under six different categories, and few which have nowhere else to be classified—except as “miscellaneous”. **”Buzz” Boll hailed from the tiny town of Fillmore, in a farming community in Saskatchewan. He joined the Maple Leafs for one game in the playoffs in 1933. In the fall he returned as a full-fledged member of the Blue and White. Not surprisingly, as was the case with most pro pucksters of that era, he bolstered his earning by working during the summer months. In his particular case he toiled on his own farm. In the October 30, 1943 issue of the Globe and Mail, it was reported that, at this juncture of the new campaign “he will rejoin the Boston Bruins having recovered from the effects of feeding one of his thumbs into a threshing machine on his Saskatchewan farm”. **John Hutchings, as a member of the Oshawa Generals, was chosen 148th by the New Jersey Devils in the 1982 draft. But he attracted almost as much attention two years previously. During the summer of 1980 he suffered a broken leg when run over by a tractor, causing him to miss the entire 1980-81 OHL campaign. **Without a doubt the most bizarre incident involving an NHL’er and husbandry must be attributed to Pat Verbeek. 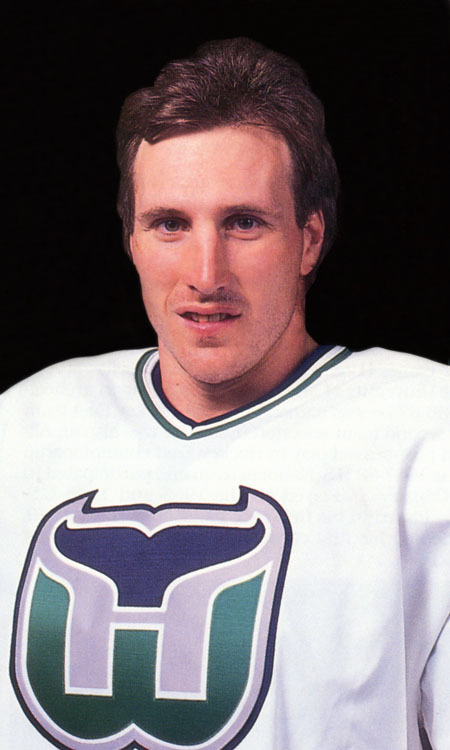 The energetic winger of the Hartford Whalers nearly saw his career ended by a freak accident on his farm near Sarnia, Ontario. While loading his corn planting machine, he reached out to snag a piece of paper to prevent it from clogging up the works. But he reached too far and his left hand got caught in the auger. It cut off his thumb and caused severe lacerations to his other fingers. His brother rushed him to the hospital, but in their haste he forgot to retrieve the severed digit. Thanks to his father, who searched through four different bins before finding it, the stub was able to be re-attached. He was ready for training camp in September, with no adverse effect on his ability to hold a stick. In the good old days, bicycles were often referred to as “wheels”. Of all the conveyances which have wheels, this one seems to have been responsible for hockey hurts away from the rink more than any other. **For instance, in March of 1973, Cliff Schmautz prompted this headline: “Schmautz flattened after 4-goal game.” Apparently he was teaching his 9-year-old how to ride a bicycle, and as he was demonstrating this skill, he went head over tin cup over the handlebars and landed on his head. He ended up in the hospital with a concussion. **40 years later, another NHL’er had an even more serious scrape on a two-wheeler. In 2014, Calgary defenseman Cory Sarich was doing some mid-summer training. On July 21, he chose a 40-minute spin on his bike on a quiet road. As he was approaching a descent he came face to face with a pick-up truck. Suddenly the driver, without signalling, made a left-turn in front of him. He braked hard, but it was too little too late, and he slid right under the vehicle. The back wheel ran over his body crushing him. He suffered five fractured vertebrae; burns on his shoulder and wrist from the muffler; an injured left arm; and cut head; and road rash. His helmet was busted into seven pieces, and the strap was around his neck choking him. Miraculously, he was able to stand up and hail a passing car. He was airlifted to a Calgary hospital, where he lay in bed for weeks recuperating. **One could hardly call it going out in style. Not skates, but a skateboard, ended the career of Pat Quinn, veteran captain of the Atlanta Flames in April of 1976. The big Irishman and his wife had just returned from a Florida vacation, and he was demonstrating how to use the skateboard he brought back for Valerie, his 12-year-old daughter. He related that his driveway had quite a sharp incline, and as he picked up speed he determined to hop off before he rammed into his car. He jumped. His body “went one way” but his “feet stayed where they were”. Both the tibia and fibula of his right leg were broken. He was expected to spend 14 weeks in recovery. In actuality he never played hockey again. **Some pranks can prove to be very costly. With Doug Wickenheiser, the price he paid was a torn ACL and MCL. The prank—the infamous “snipe hunt”—had already concluded. But when he and some of his St. Louis Blues mates exited a pizza parlour later on, they were climbing into the back of a pickup truck. “Wick” lost his balance and fell backwards into the windshield of a car following slowly behind. It took hours of reconstructive surgery to repair the damage. The freak mishap took place on March 14, 1985. He didn’t return to action until January 21, 1986. **A different kind of wheels figured in Erik Johnson’s misfortune. And his hurt was even more unusual. During a team golf outing in the 2008 off season, he somehow got his foot jammed between the brake and the accelerator pedals of his cart. The result was two torn ligaments in his right knee. It was as embarrassing to him as it was painful. H2O, present in several different scenarios, was the culprit in at least nine setbacks in the experiences of pay-for-play pucksters. **Back in 1953, the incomparable Doug Harvey was enjoying one of his favourite summer pastimes—fishing. In a private lake south of Mount Laurier he was after trout. He snagged one, and gave a mighty yank to land it. But the hook dislodged from the fish’s mouth, and, propelled by the heft of the weight, flew directly into his left eye. Not only was the injury painful, but for several weeks he had virtually no sight in that eye. Gradually, however, the blood clot dissipated, and his vision returned to normal. **Water skiing is a fun sport. But it does not come packaged with injury-free guarantees. Two skaters who spent time with the Penguins found that out. As the 1971-72 season loomed on the horizon, Rick Kessel was pencilled in to take his place in the lineup. However, he came out second best with those recreational pontoons. He badly fractured his ankle which put him on the shelf for a long time. Three years later, Ron Jones missed training camp and part of the 1974-75 campaign for the same reason. He was water skiing in August in B.C., ending up with torn muscles in his knee and thigh—serious enough to require surgery. ** No tow rope was involved in Wayne Bianchin’s 1974 water calamity. But he was on the water, surfing in Hawaii, when a giant wave swamped him. He hit his head so hard that he broke his neck—requiring fusion. It looked for a while like his career was ended. He experienced severe headaches which curbed any stressful activity. It was three seasons before we was able to play a full season again with those same Penguins. **Michael Renberg was enjoying his summer at home in Sweden in June 2000. One day he had finished taking a ride and was pulling up anchor in shallow water. He stumbled and fell out of the boat, hitting the idle propeller on the way down. It sliced a muscle in his arm, hospitalizing him. Although no nerves were damaged, he was in a cast for three weeks. It has long been established that more accidents happen at home than anywhere else. A cursory glance at mishaps in the lives of shinny mercenaries convincingly confirms that statistic. **On March 10, 1972, Gord Kannegiesser hopped out of bed one morning, slipped, and cut his thumb on his big toenail. It required 10 stitches to close the wound. **There is a TV ad which states that more seniors are hurt by falls than any other accident. Apparently falling off a ladder is not unknown among those who reach the heights of stardom in the world’s fastest game. In November of 1981, goalie Jim Craig did the trick. He got off rather lightly—he only sprained his ankle. With Paul Gardner it was more serious. When he hit the ground he broke both heels. The mishap took place four days before the beginning of the 1983/84 season, causing him to miss three weeks of play. **The aftermath of Christmas takes many forms. But for Rick St, Croix it in 1984, it was a self-inflicted gash, when he started to chop up his tree for firewood. For a man whose avocation was growing them you would have thought he would have been more careful. **1988 was not a good year for NHLers. Goalie John Vanbiesbrouck sat down on his glass coffee table, and it broke. As it split he fell. On the way down to the floor a jagged edge sliced his wrist. **That same year, Sylvain Turgeon was doing some repair work on his car which required welding. Trying to look more closely at the fusing he failed to use his mask and suffered flash burn to his eyes. **In 1987, Mark Reeds felt the urge to make some popcorn. He chose the old-fashioned method and poured some oil into a frying pan. It burst into flames, causing second and third degree burns to his hands. **”Cleanliness is next to godliness”, the old adage has it. But in 1991, Darren Turcotte got carried away in his attempt to loosen some wax in his ear—and punctured an eardrum. **It is widely known that Glenn Healy is one of only two NHL’ers who has been known to play the bagpipes (Dunc Fisher is the other) Apparently it is necessary to remove the bag in order to clean the inside of the mechanism. In doing so, he badly cut his hand. It needed 10 stitches to repair the damage. **Would Velcro have made any difference? In 2004 Ron Tugnutt pulled his groin when he bent over to tie his shoes. **Also in 2004, Jack O’Callahan was involved in one of the most basic kitchen chores—washing dishes. We wonder if he immediately purchased a dishwasher—since he cut his hand in the process. **Oh! The price of vanity. In 2005 Manny Fernandez hurt his shoulder while using a blow dryer to dry his hair. **Who knew that food could be so dangerous a commodity? Unless one accidentally mistook poison toads for mushrooms, or got a fishbone caught in the throat, common edibles do not need a skull and crossbones warning label. However, in 2007, as Brent Sopel bent over to pick up a fallen cracker, he “put his back out”, as they say. In 2010, Dustin Penner’s reach was much shorter, but it had similar results. His wife had just served him pancakes; and as he bent for his first bite, his sacroiliac went into spasm. **It’s several steps from the kitchen to the driveway. But misfortune can land there just as easily—if not more so. Hall of Famer Joe Sakic found that out, much to his chagrin in December 2008. He had an argument with his snow blower, and he lost. Three fingers were broken and tendons on his left hand were damaged, as he “put his hand where it should not have been” (official word from the Colorado Avalanche). The surgery by a specialist was successful, but cost the slick centre three months of the season. **Wally Hergesheimer plied his trade on the ice lanes during the so-called Original 6 era. For competitors in that time frame, summer jobs, not vacations, were the norm. During that off season, he was employed as a punch press operator. Unfortunately, those hungry machines have an appetite for phalanges. His right hand got caught in the press, severing his middle and index fingers up to the knuckles. That prompted some loss of power in his shot, and earned him the nickname of “Fingers”. **In July of 1978, Ryan Walter was practicing some lacrosse maneuvers in his back yard. He turned the wrong way and blew out his knee. **In December of that same year, Steve Durbano, whose hobby was getting into fights on the ice, was tuning up for future combat. He was working on his punching bag and broke his hand. At least his possible victims were safe for a few weeks. **It would be hard to top the bizarre experience of Fred Arthur. While at training camp in 1980, he stepped in a pothole crossing a street and sprained his ankle. **Both Steve Shutt and Larry Robinson enjoyed the sport of polo as a distraction from the ice wars. But for the latter, in August of 1987, he was forced into an extended rest period from any sport when he broke his leg. **One of the latest fluke misfortunes took place in August of 2013. Claude Giroux was enjoying a friendly game on the links, when his club exploded as it connected with the ball. Splinters went into his fingers. It took almost 6 weeks for the healing to take place. **The list seems endless. But we would be remiss to bypass the unbelievable experience of Ron Homenuke, who played only one game with the Vancouver Canucks. While hiking in B.C. he was climbing on a glacier. He lost his footing and slid 2,000 feet before crashing to a halt. He was in a coma for a month. He lost the ability to walk and talk as a result a fractured skull and brain stem injury. He recovered and is now in missionary work overseas. ******Oh yes! And the “Looney Gratoony” himself, Gilles Gratton, claims he was wounded in a former life, while fighting in the Spanish-American war.